The Macro Master – The Canon EF 180mm f/3.5L Macro USM lens is the longest macro lens made by Canon and what you really want trying to get really close-up on small insects and spiders. Trying to capture these small animals or isolation flowers the Canon EF 180mm f/3.5 L USM Macro lens becomes essential. The focal length give you the distance to the animals you need to avoid scaring the bugs away but on the other hand result in a very shallow depth of field – which can be good or bad depending on the result you want. 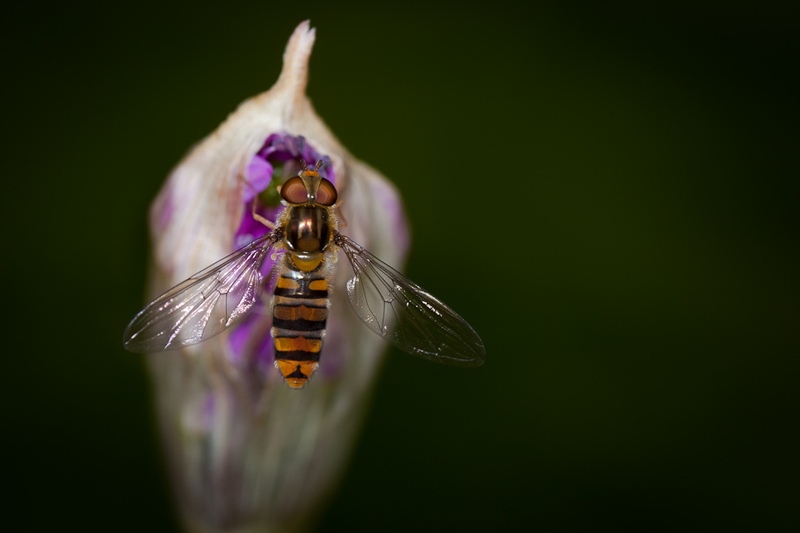 I captured the above image of a Hover Fly in Edinburgh Royal Botanic Garden. The lens was the Canon 180mm f/3.5 together with the Canon 5D Mark II solid on my Gitzo tripod. The lens seems to be extremely well build and feels nice solid and heavy in you hands so it a pleasure to use. It a challenge to use hand held and is should really always be on a tripod – even if you us a flash because is so hard to focus correctly hand held. This lens offers the longest 1:1 macro working distance of any Canon lens and produces a beautifully out of focus background. This lens does require perfect technique and is much more demanding than the Canon 100mm f/2.8 Macro. When I first got this lens I thought it was a bit soft but I found this was just down to the way I was using it coupled with the incredibly shallow depth of field. 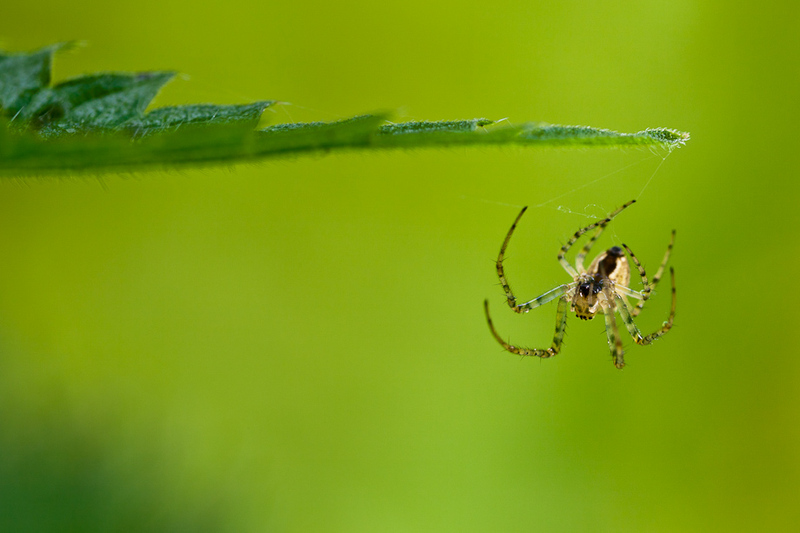 Image of Spider hanging in web from green leaf. Even though the aperture is f/8.0 the depth of field is really narrow. The image was captured with the Canon 180mm f/3.5 and the Canon 5D Mark II on my Gitzo tripod. I bought mine second hand so it been worth every penny and proved to be a perfect companion to the Canon MP-E 65mm f/2.8 Macro. I captured this image of a red flower in Edinburgh Royal Botanic Garden. The image was captured with the Canon 180mm f/3.5 and the Canon 5D Mark II on my Gitzo tripod. The aperture is f/8.0 giving a very narrow depth of field. 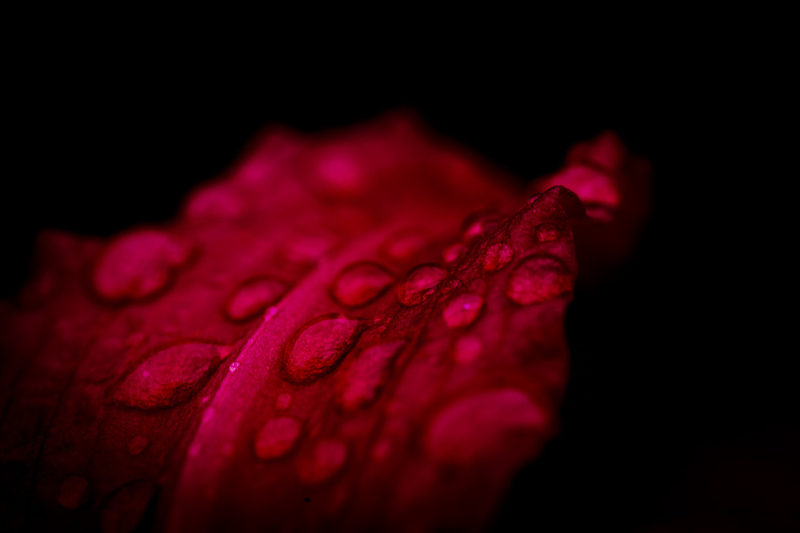 I really like the image of the red flower isolated against a black background – that is something you can really do with excellence when working with the Canon 180mm f/3.5 Macro lens. If you want to read more about the lens have a look at this extensive review of the Canon 180mm f/3.5 Macro lens.